One hundred and forty Nigerians were yesterday deported from Libya for immigration and sundry offences. The deportees were flown in a chartered aircraft that landed at the cargo section of the Murtala Muhammed International Airport, Lagos. According to immigration sources, 74 of the deportees are adult females, 52 adult males, three infants and six unaccompanied persons . The source said the return of the deportees was facilitated by the cooperation between Nigeria and the International Office of Migration ( IOM). Some of the deportees narrated their ordeal in Libya, and expressed mixed feelings on their return. 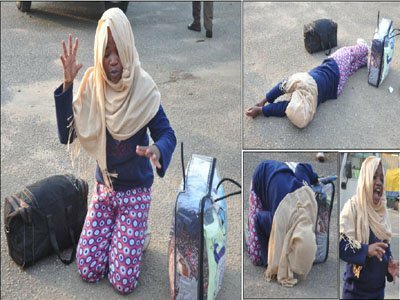 One of the 140 Nigerians deported from Libya,rolled on the floor, thanking God for her safe return. On arrival, the deportees were documented by relevant security agencies before they were ferried out of the airport by buses provided by emergency relief organisations.